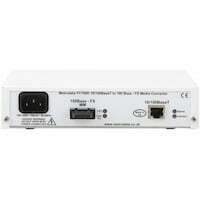 Designed for the Fast Ethernet arena, the FC7X00 Ethernet media converter family provides conversion from twisted pair 10/100BaseT to 100Base-FX fibre offering either multi-mode or single-mode options. The FC7X00 is a switching Ethernet media converter operating in store and forward mode. The FC7X00 supports auto-negotiation, and auto MDI/MDIX cross-over switching on the copper interface. To ensure reliable operation, the FC7X00 also supports Link Loss Forwarding, whereby a fault on the fibre will automatically force a link down on the copper port to indicate to the attached device that there is a link problem. Using fibre optics the FC7X00 products extend the operating distance for a 10/100baseT network to 5km using multimode fibre, or to either 30km or 70km using singlemode fibre. Despite these quoted maximum operating distances for the FC7X00 products, specific installations may only operate over lower distances due to the variations in losses of different types of fibre cable, the use of connecting fibre cables, or patch panels. When operating over 50% of the maximum distances it is advisable to calculate all fibre optic connector and cable losses and compare these with the fibre optic loss budget specified for this product. As standard, the 100Base-FX interface is presented using duplex SC fibre transceivers and operates at a nominal wavelength of 1300nm. Other options such as ST and FC/PC are available upon request. The FC7x00 products are available with a choice of 100-250 VAC or -48 VDC integral power supplies. The FC7x00 can easily be rack mounted in either a 1U two unit rackmount kit, a 6U eighteen unit rackmount kit. The FC7X00 is part of a range of fibre conversion products from Metrodata. The wider product range offers fibre conversion solutions ranging from 300 baud RS-232, via Nx64kbps rates, through 2Mbps and up to 155Mbps for electrical to fibre conversion; or 155Mbps, 622Mbps or Gigabit Ethernet for fibre mode or wavelength conversion. This application shows a pair of Ethernet switches connected over a multimode fibre using a pair of FC7000 units. This multimode fibre could be within a building (e.g. between two different floors of a tower block), or across a campus (e.g. between two departmental buildings of a University). This application shows a pair of Ethernet switches connected over a singlemode fibre using a pair of FC7100 units. This singlemode fibre could be between buildings (e.g. across a business park), or across a city (e.g. over a rented fibre). This application shows a pair of Ethernet switches connected over a singlemode fibre using a pair of FC7200 units. This singlemode fibre could be across a city, or between cities (e.g. over a rented fibre).